For some kids, switching schools can be disastrous. New building, new teachers, new friends. 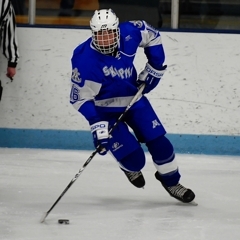 Last year, Connor Thie walked the halls of Hopkins High School and notched 25 points (10 goals, 15 assists) for the Royals during the 2010-2011 season. 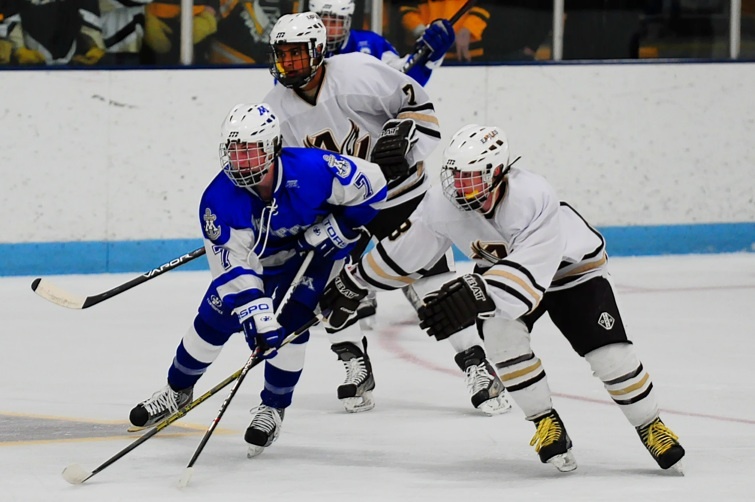 This year after transferring to Minnetonka, it appears Thie won’t have any issues making any new friends after scoring twice in his first game as a Skipper resulting in a 6-0 victory over Apple Valley on Tuesday, Nov. 29. Among the many changes since last year, the quick start to the 2011-2012 season is a welcome one. 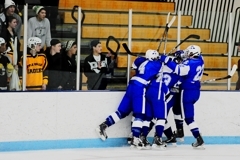 That decision may not be Thie’s to make according to Minnetonka coach Brian Urick. “Connor is opportunistic,” Urick said. “He's good around the net but it also helps to be playing with (Sam) Rothstein who finds guys. (Erik) Baskin knows that well; he played with Rothstein last year and had 20-some goals. Playing on a line with Baskin and Rothstein -- who scored a combined 63 points (28 goals, 35 assists) last season -- will likely lead to continued success for Thie. It’s a chemistry that seems to be felt throughout the line. 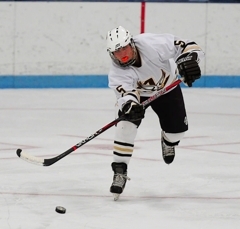 “I've been playing with Baskin for a while now -- it’s been all the way through youth hockey,” Rothstein said. 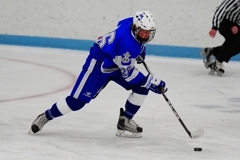 “Connor (Thie) has been new but it's been easy playing with him. He moves the puck well and he obviously scores. For Thie, everything seems to be settling into place with locked-in line on a new team that is starting to feel like home. “Everybody is really great, they all care about hockey a ton,” Thie said. “We just have great chemistry. This is probably the closest team I've ever been apart of already. 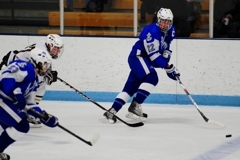 Following Minnetonka’s 6-0 victory over Apple Valley to kick off the 2011-2012 season, Skippers coach Brian Urick took some time to speak with the MN Hockey Hub on the game, the team and the upcoming season. Question: Besides the game’s overall result, what were your thoughts on your team's performance? Answer: It was good. A little rough. Our defense played solid. I thought the gaps were good. I thought they played really well. Our forwards took advantage of their chances. We didn't have a lot of opportunities up-front but I thought they capitalized on them and I thought the second two periods our guys started to move their feet a little bit. Q: It was a somewhat slow start to the game with several minutes ticking off the clock with no penalty, goal or even a shot on goal. What did you say to the team on the bench for motivation? A: Get your feet moving. Everybody in the first game is a little bit tight, little bit nervous and kind of standing around watching. Both teams were kind of feeling each other out. So it's like just get it going. Get a hit in, get a shot on net, get into the game -- you've been doing it for two weeks already. 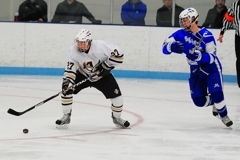 Q: Looking over this year’s Minnetonka roster, it seems as though there is high-scoring potential everywhere. What was the thought process that went into forming your team's top two lines? A: (Sam) Rothstein and (Erik) Baskin did so well together last year that we decided to keep those two together. (Vinni) Lettieri and (Max) Coatta have grown up playing together all the way from Squirts up to Bantams so we thought they'd be a good match. Give Baskin and Rothstein a little grit with Connor (Thie) -- I like (Thie’s) tenacity around the front of the net and it gives Rothstein two guys that can bury. 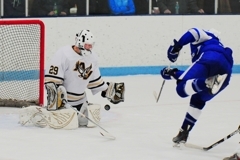 Q: Minnetonka has had rough endings the past two seasons (a loss in the Class 2A State Championship in 2010 and a loss in Section 6AA semifinals in 2011). Now the Skippers are ranked No. 3 in the preseason polls. Was this a statement game for the team? A: I think we're trying to take one game at a time. That's what we're working (on) with the guys. They have a lot of expectations on themselves and they want to do really well this year. But it's just like, ‘Let's take one game at a time and get better each game.' So I think it was a good start, we definitely found things we need to work on but I thought it was a good start and our guys are excited. It may be hard for coaches to find any form of silver lining in a 6-0 loss. While Apple Valley coach Jerry Hayes is certainly not celebrating the unfortunate start to the 2011-2012 season, he isn’t throwing in the towel just yet. “We knew were going to have some issues,” Hayes said. “We had some guys sick and so we had a rough week getting ready for today with our power play and that showed giving up the two (shorthanded goals). Certainly that's on us coaches, just lack of preparation getting guys ready. Before and after the lop-sided matchup, Hayes spent some quality time having friendly discussions with Minnetonka coach Brian Urick. Respectfully, Hayes wasn’t afraid to continue the praise of the No. 3-ranked Skippers. “They were doing some awful nice things with the puck -- some saucer passes, looking back door and they weren't mishandling the puck much,” Hayes said. “Where when we got the puck on our stick, it looked like a hand grenade, just trying to get rid of it. Knowing there is plenty of room for improvement, Hayes is hoping his team learned something from the loss. He is also ready to get back practicing something that the Eagles need to work on immediately. “Our (defensive) zone and taking some pride in our (defensive) zone,” Hayes said. “We were kind of tail chasing the dog a little bit and not being as physical as we would like to normally be in the defensive zone. We were losing a lot of races for pucks, losing battles for pucks and we were trying to get into stick battles for pucks against guys who have pretty good sticks over there and that's not how we're going to win hockey games. 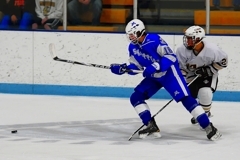 Appearing in his first game for Minnetonka, Connor Thie scored two goals and Sam Rothstein had three assists in a three-goal first period propelling the Skippers to a 6-0 victory over Apple Valley on Tuesday, Nov. 29 at Apple Valley Sports Arena. 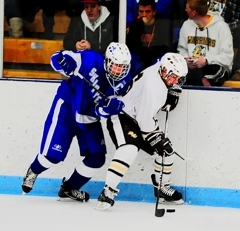 Also powering the Minnetonka offense were junior forwards Sam Coatta and Vinni Lettieri, who each notched a goal and an assist. 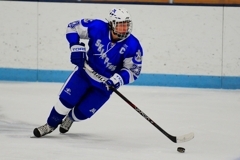 Skippers' junior defenseman Jimmy Schuldt also added a goal and an assist. 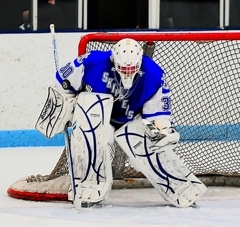 Senior goaltender Matt Behounek recorded a shutout, making 16 saves for Minnetonka. 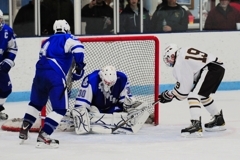 Constantly facing a barrage of high quality shots, Apple Valley senior netminder Matt Koziy made 21 saves. 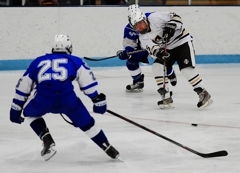 The Eagles (0-1-0) will look to rebound as they travel to Cottage Grove Ice Arena on Thursday, Dec. 1, to take on East Ridge at 7:30 p.m.
Minnetonka (1-0-0) will host Burnsville at 7 p.m. on Thursday, Dec. 1, at Pagel Activity Center. 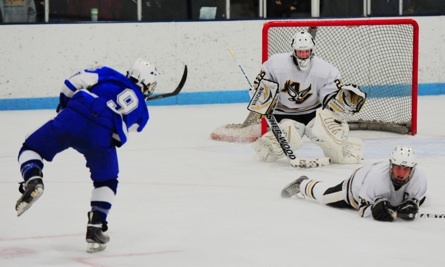 Providing a quick goal to set the game's tone, Thie buried a cross-crease feed from linemate Sam Rothstein to put the Skippers on the board. 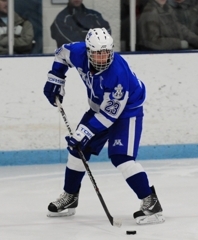 The junior forward, who scored twice in the first period, transferred to Minnetonka this school year after playing for Hopkins in 2010-2011. Thie seems to have already found a niche playing with Rothstein and senior forward Erik Baskin. 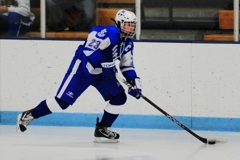 Last season Thie had 25 points (10 goals, 15 assists) for the Royals. Heading into the locker room after the first period, Rothstein must have had a huge smile on his face. 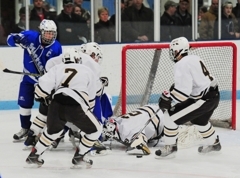 After all, his team held a commanding 3-0 lead against Apple Valley. 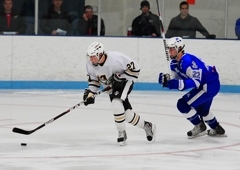 On top of that, the senior forward had assisted on each of those three goals with two assists coming on goals by linemate Connor Thie and another coming on a shorthanded chance that was finished by Jimmy Schuldt. 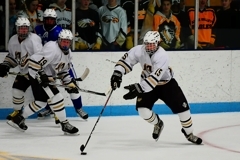 Any sort of momentum Apple Valley had or motivation the Eagles might have gained during the first intermission was quickly snuffed out by Lettieri who scored 24 seconds in the second period. 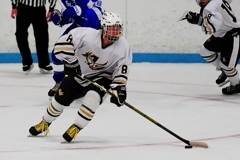 The junior forward and future Gopher finished the game with two points (one goal, one assist) and deservedly drew heavy attention from Apple Valley defensemen throughout the night.